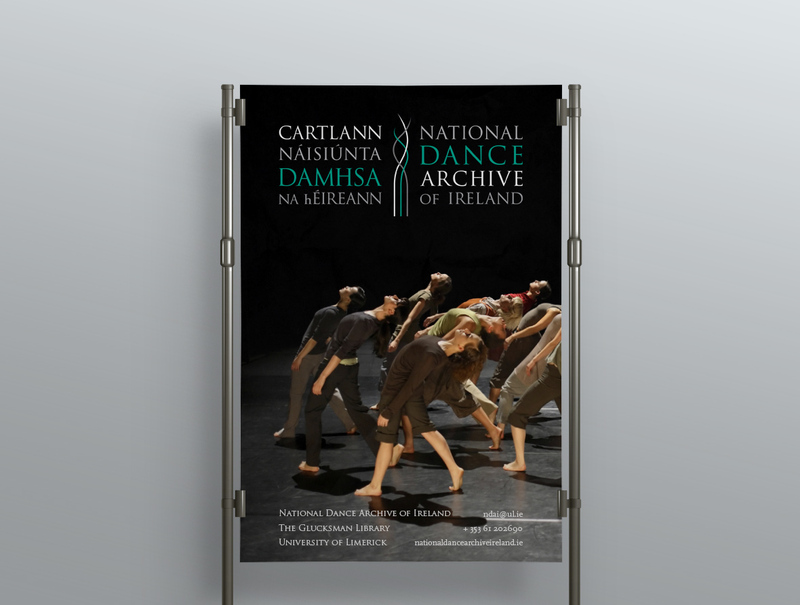 The brief called for an identity design for the new National Dance Archive of Ireland being housed at the Glucksman Library, University of Limerick. A stipulation within the brief required the full title in both English and Irish with no acronym. A logo, brand guidelines, and a variety of promotional materials were to be supplied. The Irish and English language titles are set in the Trajan Pro typeface, giving an official and elegant feel equal to the archive’s status as a national cultural asset. The symbol is an abstract representation of the archive. It encapsulates the wide variety of dance genres through three individual strands, undulating at the top to represent the motion of dance, and coming together in parallel at the base, representing the structure and order of the archive.